Francis Ford Coppola's film "Apocalypse Now" was inspired by Heart of Darkness, a novel by Joseph Conrad about a European named Kurtz who penetrated to the farthest reaches of the Congo and established himself like a god. A boat sets out to find him, and on the journey the narrator gradually loses confidence in orderly civilization; he is oppressed by the great weight of the jungle all around him, a pitiless Darwinian testing ground in which each living thing tries every day not to be eaten. What is found at the end of the journey is not Kurtz so much as what Kurtz found: that all of our days and ways are a fragile structure perched uneasily atop the hungry jaws of nature that will thoughtlessly devour us. A happy life is a daily reprieve from this knowledge. A week ago I was in Calcutta, where I saw mile upon square mile of squatter camps in which hundreds of thousands live generation after generation in leaky huts of plastic, cardboard and scrap metal, in poverty so absolute it is impossible to see any hope of escape. I do not mean to equate the misery of those hopeless people with a movie; that would be indecent. But I was deeply shaken by what I saw, and realized how precious and precarious is a happy life. 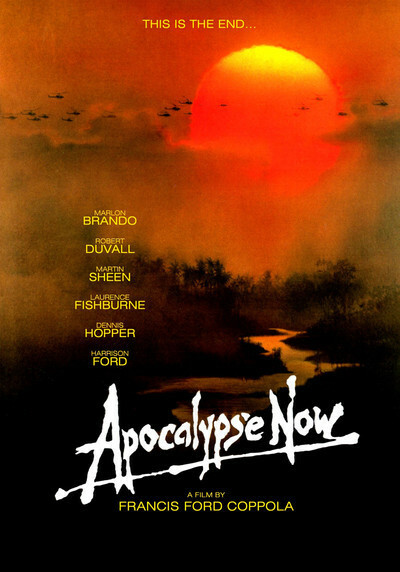 And in such a mood I watched "Apocalypse Now" and came to the scene where Col. Kurtz (Marlon Brando) tells Capt. Willard (Martin Sheen) about "the horror." Kurtz is a decorated hero, one of the best soldiers in the Army, who has created a jungle sanctuary upriver inside enemy territory, and rules Montagnard tribesmen as his private army. He tells Willard about a day when his Special Forces men inoculated the children of a village against polio: "This old man came running after us and he was crying, he couldn't see. We went back there, and they had come and hacked off every inoculated arm. There they were in a pile, a pile of little arms. . . ."
What Kurtz learned is that the Viet Cong were willing to go to greater lengths to win: "Then I realized they were stronger than we. They have the strength, the strength to do that. If I had 10 divisions of those men, then our troubles here would be over very quickly. You have to have men who are moral and at the same time who are able to utilize their primordial instincts to kill without feeling, without passion, without judgment." This is the "horror" that Kurtz has found, and it threatens to envelop Willard, too. The whole movie is a journey toward Willard's understanding of how Kurtz, one of the Army's best soldiers, penetrated the reality of war to such a depth that he could not look any longer without madness and despair. The film has one of the most haunting endings in cinema, a poetic evocation of what Kurtz has discovered, and what we hope not to discover for ourselves. The river journey creates enormous anticipation about Kurtz, and Brando fulfills it. When the film was released in 1979, his casting was criticized and his enormous paycheck of $1 million was much discussed, but it's clear he was the correct choice, not only because of his stature as an icon, but because of his voice, which enters the film from darkness or half-light, repeating the words of T.S. Eliot's despairing "The Hollow Men." That voice sets the final tone of the film. Another crucial element in the ending is the photojournalist (Dennis Hopper) who has somehow found Kurtz's camp and stayed there, stoned, as a witness. He blathers to Willard that Kurtz is "a poet-warrior in the classic sense" and "we're all his children." In the photographer's spaced-out ravings we hear disconnected snatches of the poetry he must have heard Kurtz reciting: If you can keep your head when all about you . . . I should have been a pair of ragged claws, scuttling across the floor of a silent sea. . . ." The photographer is the guide, the clown, the fool, providing the balance between Willard and Kurtz. Why has "Apocalypse Now" been so long bedeviled by rumors that Coppola was not happy with this ending? At the film's premiere at Cannes, I saw the confusion begin. Coppola originally intended to show the movie as a 70mm roadshow with no credits (they would be printed in a booklet). But the 35mm release would need end titles. After he was finished filming on the huge set of the Kurtz compound, Coppola was required by the Philippine government to destroy it, and he photographed it being blown up. He decided to use this footage over his closing 35mm credits, even though (this is crucial) he did not intend the destruction of the compound as an alternative "ending" to the film. Alas, confusion about the endings spread from Cannes into movie folklore, and most people thought that by "ending" he meant all of the material involving Kurtz. In the 20th anniversary DVD release, Coppola patiently explains all of this once again. In any event, seen again now at a distance of 20 years, "Apocalypse Now" is more clearly than ever one of the key films of the century. Most films are lucky to contain a single great sequence. "Apocalypse Now" strings together one after another, with the river journey as the connecting link. The best is the helicopter attack on a Vietnam village, led by Col. Kilgore (Robert Duvall), whose choppers use loudspeakers at top volume to play Wagner's "Ride of the Valkyries" as they swoop down on a yard full of schoolchildren. Duvall won an Oscar nomination for his performance and its unforgettable line, "I love the smell of napalm in the morning." His emptiness is frightening: A surfing fanatic, he agrees to the attack only to liberate a beach said to offer great waves ("Charlie don't surf"). There is also the sequence where the patrol boat stops a small fishing boat with a family on board. A little girl makes a sudden dash, and the jumpy machine-gunner (a young Laurence Fishburne) opens fire, wiping out the entire family. It turns out the girl was running for her puppy. The mother is not quite dead. The boat chief (Albert Hall) wants to take her for medical treatment. Willard puts a bullet into her; nothing can delay his mission. He and "Chief" are the only two seasoned military men on the boat, trying to do things by the book; later, in a scene with peculiar power, the chief is astonished to be killed by a spear. For me the most remarkable visuals in the film occur when Chef (Fredric Forrest), one of Willard's crew members, insists on venturing into the forest in search of mangos. Willard can't stop him, so he joins him. The great cinematographer Vittorio Storaro shows them as little human specks at the foot of towering trees, and this is a Joseph Conrad moment, showing how nature dwarfs us. The rock 'n' roll soundtrack opens and closes with "The End" by the Doors, and includes disc jockeys on transistor radios ("Good morning, Vietnam!"). The music underlines surrealistic moments, as when Lance (Sam Bottoms), one of Willard's crew, water-skis behind the boat. It also shows how the soldiers try to use the music of home, and booze and drugs, to ease their loneliness and apprehension. Other important films such as "Platoon," "The Deer Hunter," "Full Metal Jacket" and "Casualties of War" take their own approaches to Vietnam. Once at the Hawaii Film Festival I saw five North Vietnamese films about the war. (They never mentioned "America," only "the enemy," and one director told me, "It is all the same--we have been invaded by China, France, the U.S. . . .") But "Apocalypse Now" is the best Vietnam film, one of the greatest of all films, because it pushes beyond the others, into the dark places of the soul. It is not about war so much as about how war reveals truths we would be happy never to discover. In a way I cannot quite explain, my thoughts since Calcutta prepared me to understand the horror that Kurtz found. If we are lucky, we spend our lives in a fool's paradise, never knowing how close we skirt the abyss. What drives Kurtz mad is his discovery of this. Note: In my original review of "Apocalypse Now" I quoted the French director Francois Truffaut: "I demand that a film express either the joy of making cinema or the agony of making cinema. I am not at all interested in anything in between." Coppola's joy and agony are revealed in "Hearts Of Darkness: A Filmmaker's Apocalypse," a 1991 documentary by Fax Bahr and George Hickenlooper about the making of "Apocalypse Now," with personal footage and journal entries by Coppola's wife, Eleanor, who made secret recordings of Coppola expressing his doubts and discouragement as the project threatened to swamp him.